Quinton de Kock and Hashim Amla slammed quick centuries to set up South Africa's convincing 88-run victory that helped it complete a 5-0 sweep of Sri Lanka in the fifth and final One-Day International in Centurion on Friday (February 10). The clean sweep also helped South Africa climb to the No. 1 spot in the ICC ODI rankings. Sri Lanka won the toss and opted to bowl but nothing else went its way. South Africa amassed a massive 384 for 6 before restricting the visiting side to 296 for 8, despite Asela Gunaratne's maiden ODI century (114*). Sri Lanka's poor day on the field started as soon as de Kock and Amla walked in to bat. The opening pair added 187, a record for South Africa against Sri Lanka. De Kock hit 109 off 87 balls, playing the dominant role, while Amla was more circumspect initially before accelerating to finish on 154 off 134 balls. Amla equalled AB de Villiers's South African record by bringing up his 24th ODI century but enjoyed good fortune in the initial stages. He survived chances on 27 and 42 as Sri Lanka, nearing the end of a largely dispiriting tour, was sluggish on the field. De Kock needed only 80 balls to reach his 12th century in just his 74th match. On the ground where, in his previous ODI appearance he had hit 178 against Australia, another big one seemed possible as he reached his century in the 25th over but he only faced seven more balls before being caught on the point boundary. Amla, meanwhile, took 112 balls to reach his century but cut loose after reaching the landmark, hitting another 54 runs in 22 deliveries and adding five sixes and three fours to the 12 boundaries he hit in reaching three-figures. Suranga Lakmal was the pick of Sri Lanka's bowlers on a tough day, claiming three wickets while conceding 71 runs in ten overs. With no other option, Sri Lanka started its chase on a rapid note but lost wickets in the process, being reduced to 70 for 4 before the end of the ninth over. 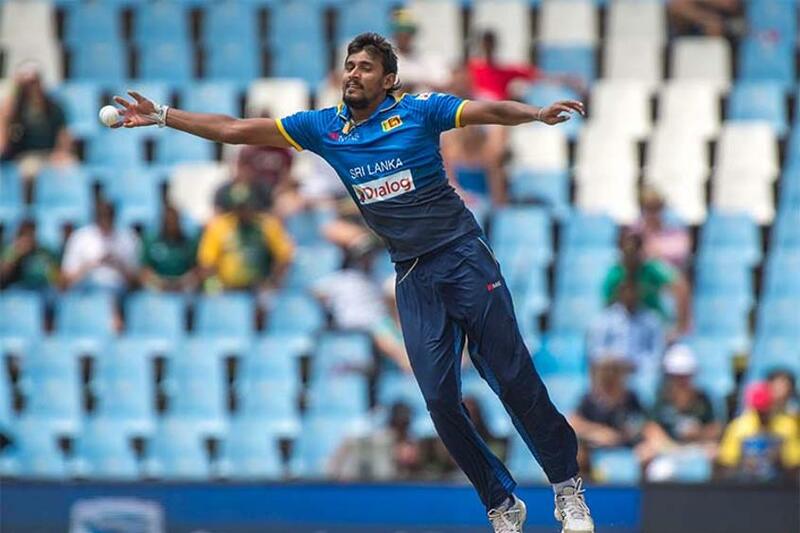 Niroshan Dickwella began on a promising note with a flurry of boundaries but Chris Morris struck at the other end, removing Upul Tharanga, the captain, and Kusal Mendis, in successive overs. Wayne Parnell then delivered the big blow when Dickwella mistimed a lofted shot to mid-off, falling for a 19-ball 39 with two sixes and five fours. The left-arm pacer dealt one more blow by removing Sandun Weerakkody in his next over. Sri Lanka's challenge seemed to be heading towards a quick end when Imran Tahir went through Dhananjaya de Silva's defence with a googly, leaving the visiting side 82 for 5 but Gunaratne and Sachith Pathirana gave the total some respectability with a 93-run stand for the sixth wicket. Pathirana played steadily and went past his maiden ODI half-century before Morris ended the resistance when the batsman chipped to mid-off in the 33rd over. Gunaratne, however, hung on with the tail and raced to his maiden ODI ton thumping Andile Phehlukwayo to the off-side fence in the 48th over, his second fifty taking just 25 balls. It helped Sri Lanka bat out 50 overs, but the target was far beyond its reach.